The Colonial Revival house is an informal interpretation of the “national” styles seen earlier in Classical and Greek Revival. 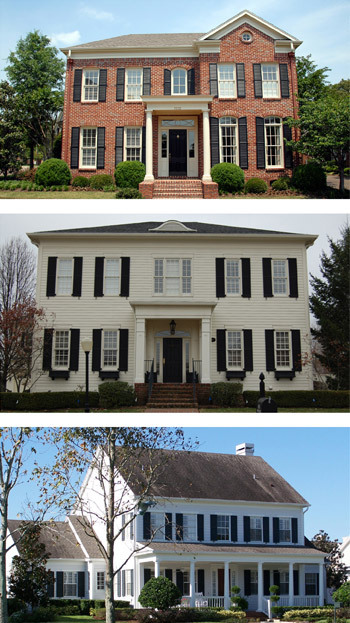 The Colonial house is an ordered composition of simple, well-proportioned volumes, with one-story porches or stoops. 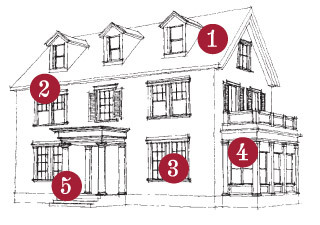 Floor plans are typically symmetrical with their massing parallel to the street, except in farmhouse “L” shapes and later gable front examples with a central chimney. Windows have broader proportions, doors are not as tall, and columns and cornice trim tend to be simpler in their design than earlier styles. Frequent use of bay windows and welcoming side porches are encouraged and give the Colonial Revival house a less formal character. 1. Simple, well proportioned rectangular massings, ridge commonly runs parallel with street. 2. Simplified cornice and details mimic and reference historical detailing. 3. Openings are well proportioned and orderly in their relationship with one another, commonly seen in pairs. 4. One-story porch or stoop, side porches are commonly used. 5. Historically based and well detailed porches and columns in either the Tuscan, Doric or Ionic orders. B. Cladding – Smooth 4-inch to 6-inch exposure lap siding, brick or painted brick. E. Lintels – Brick, pre-cast concrete, or trim. G. Foundation – Masonry brick or stone at main body; masonry piers with screening or solid masonry veneer at porch.